President Trump’s meeting with Russian President Vladimir Putin is over. They had a press conference, and all hell broke loose. Was it the Trump White House’s best moment? There’s a lot to suggest no, but the overreach by the media never ceases to amaze. Trump is being accused of outright treason or failing to forcefully push back against Putin and the interference operation they allegedly engaged in during the 2016 election. We’ll never know the full extent because a) Russia won’t extradite the 12 Russian intelligence officers indicted by the Department of Justice last week, or the dozen or so Russians who ran a troll farm before that; b) because they won’t be tried in a court, the charges will never face scrutiny and the facts never fully fleshed out. It’s all for show. Interference is different from hacking. Our election as not hacked. No vote totals were changed. Trump still won fair and square. Also, John Podesta’s email account wasn’t really hacked per se; he fell for a phishing email. It’s hardly a sophisticated attack, but one that yielded very damning information, relevant information, about the Democrats and Hillary Clinton. It aired their dirty laundry. It caused more division within the ranks over dynamics between the DNC, the Clinton campaign, and Bernie Sanders. This, plus Clinton losing, caused the Left to look for a crutch. Alas, Russiagate was born. It’s been over a year and there is still zero evidence that the Kremlin colluded with the Trump team to win an election. Yet, where many seem to have on the Hill and in the media hyperventilating, is the president seemingly throwing the intelligence community under the bus. They called it the Treason Summit, or something along the lines of Capitulation Theater. As for the deterioration of U.S.-Russia relations, Trump blamed both sides. The echoes of Charlottesville can be heard, though this is an entirely different situation. Now, Trump said today that he accepts the FBI, CIA, and NSA highly confident assessment that the Russians meddled in our election, though it’s been erroneously reported that the entire IC signed off on this. That’s not true, even former Obama Director of National Intelligence James Clapper had to remind Congress of this. Either way, the anti-Trump media went into full meltdown mode again, though not every liberal reporter is sold on this Russian collusion nonsense. Michael Tracey, formerly of The Young Turks, noted how it’s a long-standing tradition for leaders to flatter one another, even when relations are in the toilet. And yeah, Obama did it too. Rep. Adam Schiff (D-CA), the ranking member of the House Intelligence Committee, said, “this is essentially an open call or further Russian intervention.” Oh, and he called out the GOP, saying they’re complicit in the “betrayal of American interests.” No Republican cares, dude. Everyone knows the Democrats are blowing anything Trump does out of proportion. They hit the mute button—as they should on anything the Democrats have to say on this matter. Sen. Chuck Schumer (D-NY) confirmed this by suggesting without evidence that Putin has something on the president. This is insane. Mr. Schiff, Obama made the call for more intervention more than explicitly clear when he did next to nothing to confront the Russian interference under his watch. Former CIA Director Michael Morell said they "failed miserably" in their actions against the Russians to deter them from attempting this again. Sen. Mark Warner, vice chair of the Senate Intelligence Committee, said Obama choked on this front. Many Democrats feel that the Obama White House could have done more, even The Washington Post, who reported on how the former president responded to the Russian interference, makes it clear he dropped the ball. It was a huge fumble. Even CNN was asking if the Obama White House was asleep at the switch. So, if you want to hurl criticism, you have to include the former president. I’ll let you decide whether this presser was a total disaster. The reaction to it makes it seem like Trump share the nuclear codes with Russia. Former White House communications director Anthony Scaramucci called on President Donald Trump Tuesday to "reverse course immediately" and walk back some of the statements he made during the news conference with Russian President Vladimir Putin. "Trump's made a very big mistake here. He's got to reverse course immediately," Scaramucci said in an interview with CNN's Alisyn Camerota on "New Day." 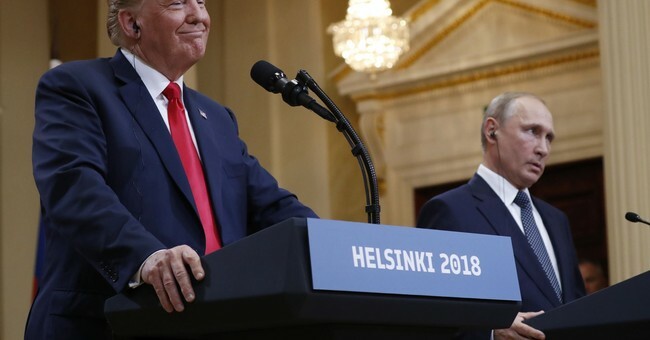 Standing beside Putin on Monday in Helsinki, Finland, Trump declined to endorse the US government's assessment that Russia interfered in the 2016 presidential election, saying he doesn't "see any reason why" Russia would be responsible. Trump also touted Putin's vigorous denial of Russian involvement. The presdient admitted today that he misspoke. Newt Gingrich called it "the most serious mistake" made during this presidency so far. We'll see what happens.Frankly, everyone needs to simmer down. We're comparing this to the 9/11 and Pearl Harbor attacks, folks. It's none of this. On the collusion front, let's revisit that one could make the argument that there’s a case against the Clinton campaign, which retained Fusion GPS, who then hired former British spy Christopher Steele to compile an opposition research file on Trump using Kremlin sources. Kremlin gave info to Christopher Steele. His oppo-research was paid for by the Clinton campaign. If that's not collusion, what is?